I don't know what the weather's like where you are, but it's been cold and rainy around here the past couple of days. So despite the fact that it's technically spring, my cravings haven't yet made the transition from hot cocoa and baked goods to ice cream. Which might explain this week's project: hot chocolate for one. I've been wanting to find a way to creatively reuse all of the baby food jars I inevitably end up simply recycling each week. 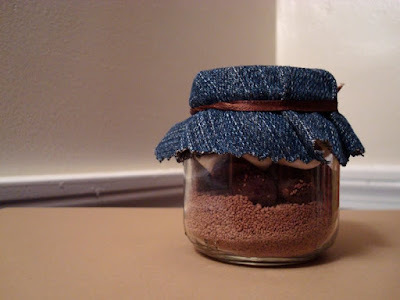 I did a search for crafty projects utilizing small jars and came up with a bunch of ideas, liking this one the best. There's enough hot chocolate mix for one mug, along with some mini marshmallows and - since the hot chocolate mix is on the mild side - a generous helping of Ghirardelli's 60% cocoa chocolate chips. I went with this project idea because I knew my time would be limited again this week, busy trying to launch another project I've been working on for years. More on that later in the week...Anyway, even so, I felt like the project needed something else, something I actually made. I embroidered another scrap of denim from Neal's old jeans used in last week's project to finish off the top. What's that on top, you ask? A mini marshmallow and a chocolate chip. Duh. The chocolate chip came out a little better than the marshmallow. Oh well. This gives me renewed respect for friend and artist Melinda Go's project, which involves a lot more embroidery. In addition to the carpal tunnel syndrome, I think I'd go blind. Anyway, as usual, this little hot chocolate for one kit is up for grabs, for free, for one week. If you'd like to win this particular giveaway, leave me a comment to that effect on this post and I'll enter your name in the random drawing at the end of the week. 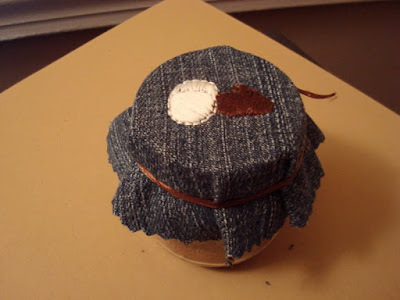 You can have a lot of crafty fun with an old pair of jeans. 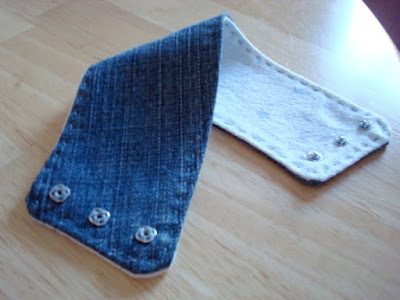 Recycled denim is a material that finds its way into some really crafty crafts, like these pocket purses, and some more, shall we say, contemporary projects, like this week's coffee cozy. As usual, this week's project evolved from wanting to do something entirely different, my search initially focused around ribbon (which is what led me to the pocket purses and similar projects, which suggested using ribbon for the strap). When I saw that the purses were made from the back pockets of old jeans, I remembered that Neal recently discovered a hole in the knee area of one of his pairs. Lucky for me he had yet to throw them out. I settled on the coffee cozy after doing more searching because, well, I like coffee. And tea. 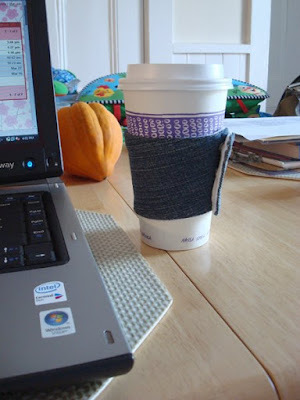 I especially like getting hot beverages while I'm out and about and making a reusable cozy goes nicely with the green theme developing throughout this ongoing project. The cozy is hand-sewn (although, if I'm going to keep settling on projects that involve fabric and sewing I should really dust off the sewing machine and try to remember how to use it), with a cotton flannel lining and a snap closure. The lining actually comes from a barely used (and, rest assured, recently laundered) baby receiving blanket that I decided to re-purpose for this project. I thought the blue stars would go nicely with the denim and we have tons of these things that I'm still not totally sure how to use. Unfortunately, as the fabric is pretty thin, should this cozy find its home around your cup of joe, I wouldn't go opening and closing the snaps any more often than is absolutely necessary. The closed cozy, however, slides on and off a medium cup of Peet's coffee (my fave), as shown, very easily. 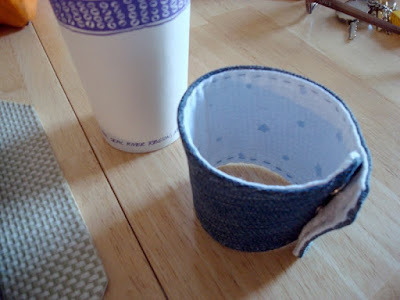 Need a reusable coffee cozy made from recycled denim? Leave me a comment to that effect (i.e. "Yes please," or, "I want this, thanks", etc.) on this post for a chance to win the random drawing at the end of the week. 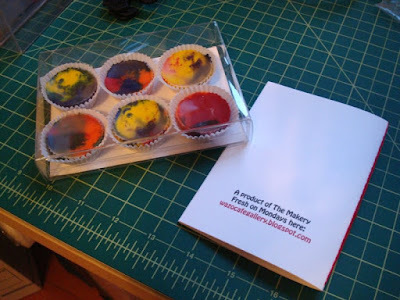 I've received several lovely comments on the latest product from the Makery and while I don't want to discourage any and all feedback, I would like to clarify that the project is also an ongoing giveaway. That means I'm giving away the stuff I make. For free. If you spend a lot of time on the Internet, you should know what that is. If not, let me school you. Blog giveaways seem to be the latest way various vendors are directing potential customers to their sites, stores, etc. By offering something smallish for free (and usually the way this works is you leave a comment or send an email and your information gets entered in a random drawing), I guess the idea is that all those folks who tried for but didn't receive the freebie will be so enamored with the product that they'll eventually plunk down some cash for whatever the company has to offer. While I'm not opposed to fame and fortune, for me the goal of this particular giveaway project is simply to give stuff away. What I'm enjoying most about the project is the creative problem solving involved in figuring out how to execute an idea using only the materials I have on hand. In the process, I'm getting rid of supplies and materials that have been cluttering my art studio-turned-corner for a few years now. I don't need all the stuff I'm making and the act of giving things away has, I guess, been a part of my work - regardless of where it falls along the art-craft continuum - for some time. So, please feel free to continue to leave all manner of feedback, but if you want to participate in the giveaway, i.e. you want whatever's up for grabs that week, please indicate this somehow in your comment. As Josh puts it in The Last Days of Disco, "A lot of people won't take no for an answer. I wanted you to know that I'm not one of them. I can be discouraged." This week's post, like this week's project, won't take long. Since I was out of town this weekend - and it's on the weekend that I usually get most of my Makery work done - I had to come up with something I could quickly put into production today and finish this evening. Picking up on the stack of paper goods I mentioned in last week's project, I decided to apply my own spring fever design inspiration to a set of ten correspondence cards with matching envelopes. The flat celadon cards measure a tad bigger than four by six inches. There's a grass motif at top, framed by a magenta ring, which matches the Zen proverb printed at the bottom. 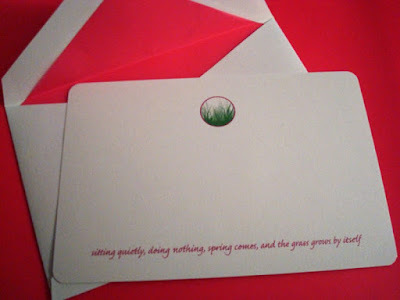 "Sitting quietly, doing nothing, spring comes, and the grass grows by itself." I added a translucent magenta liner to the envelopes, which was actually a lot easier than I thought it would be. Although I guess I should confess that I've only done the one so far, for the photo op. I'll have the other nine finished by the end of the week, though. So if, like Rachel in that one episode of Friends, you need to catch up on your correspondence, leave a comment on this post and this spring fever stationery set could be yours. I'm a little late posting this week's Makery project. I'll blame it on the hour we lost this past weekend. 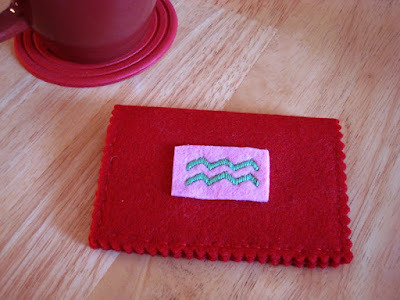 Perhaps because I'm posting late, I honestly can't really remember how I got around to making a hand sewn felt business card holder embroidered with the symbol for the zodiac sign Aquarius on the front. I vaguely remember wanting to do something with some of the dozens of colors of embroidery floss I have on hand, material that I bought for a barely-started project from years ago. Then I came across some paper products I still have from the year I worked at this store, during my adventures in retail. I have a dozen of these very lovely, sort of framed little pieces of card stock that I've never quite been sure what to do with. So I had the idea of doing embroidery on paper. And since I had twelve of these little cards, I naturally thought about using either the 12 signs of the zodiac, images from the song "The 12 Days of Christmas," or, of course, 12 Angry Men. Projects inspired by the latter two would be great fun, but since my time was limited, I went with the simple symbols and colors associated with the zodiac. Embroidery on paper, however, is a lot trickier than I imagined. 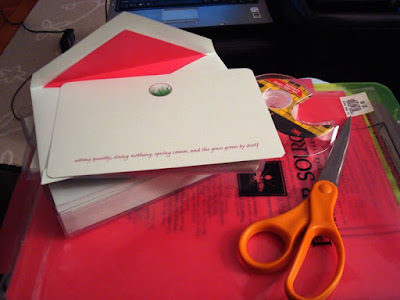 Especially on the heavier card stock I would have been using, you have to essentially punch in all of your little holes first, and then thread your embroidery floss through. It works better with lighter paper and more geometric designs (and the end result looks a lot like drawings I remember making with a spirograph). Once again, I found myself stumped by my lack of fabric. But I remembered I had this felt gift bag from Valentine's Day. Unfortunately, I didn't have enough material to do anything with all twelve signs, so I Googled felt and embroidery for ideas. I settled on the business card holder, creating my simple design after looking at three or four very similar examples elsewhere. I could have theoretically made two or three of these with the usable material from the re-purposed gift bag, but by the time I finally got into production mode I knew I'd be lucky to finish one. I went with Aquarius since the red and pink felt, of course, references V-Day, a holiday that's included within the date range of this particular sun sign. 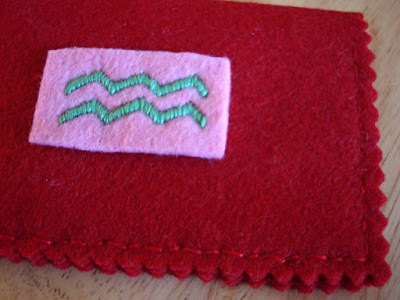 I also like the way the aqua thread looks against the pink and red material. 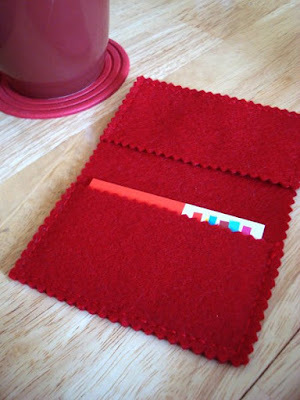 The card holder is hand-sewn because I didn't feel like dusting off my sewing machine just for this project (that and my sewing skills are a little rusty). The holder can comfortably accommodate twenty or so cards on either or both sides. I should confess that I bought fabric pinking shears to finish the edges (my paper scissors wouldn't cut through felt), which might be viewed as cheating on the self-imposed rules of this project, but as I see it, I bought a tool that I'll use over and over again, not materials for one specific project. 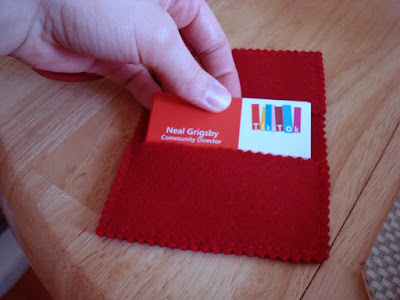 The only cards I had on hand were Neal's and I thought the shout-out would fit in nicely with the DIY spirit of this project, Tikatok being an online community where kids can write, share, and publish their own books. Nice, huh? Anyway, as usual, if you like what you see, leave me a comment on this post and this business card holder may be yours, free, by the end of the week! I'm also happy to make a couple more on special request, if you leave me a comment with your sign. This week's project was inspired by the crafty subsection of the Zeitgeist where everyone has started to make fabulous little creations (like these little frogs) by remelting and reconfiguring crayon bits. I first saw this idea in a parenting magazine and remembered that I bought a box of crayons just for the purple one in order to go along with my son's first Halloween costume as the main character from the story, Harold and the Purple Crayon. The idea, of course, is to get some extended life out of the little bits and nubs that are too difficult to manage after awhile, but I figured I could break up the fresh box I had and buy new ones when we get a little closer to coloring age. That was the most tedious part of this project, actually. I think it probably works best with lots of little nubs of lots of different colors. What I had on hand were eight big chunky crayons and four standard sized basic colors (red, green, blue, yellow). I just happened to keep the darker bits separate and I'm glad I did since those are the colors where the wax seemed to separate a bit from the pigment, like grease coagulating in a pan recently used to cook bacon. I think I may have over-cooked them a bit. I read various instructions on three or four different sites, and in the end, popped them in an oven preheated to 200 degrees for about as long as it took me to do the dishes. I was surprised they were already completely melted after only fifteen minutes since I'd read on one site that it takes up to an hour to do the trick. 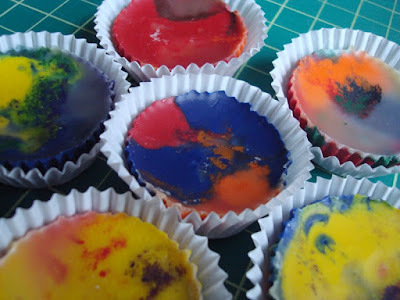 I think (obviously) the amount of crayon bits you're using and the depth of the mold have a lot to do with the temperature you need to set your oven to and the overall cooking duration. 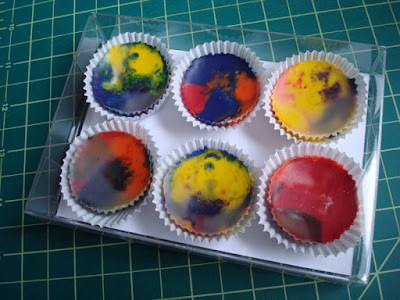 Also, I didn't have anything on hand other than a mini muffin pan to use as my mold, so my remelted crayons look a little like Reese's peanut butter cups. I nearly cheated on the rules of this project, almost buying some candy molds I spotted at A.C. Moore, but I resisted (I may have to go back, though, and buy the molds in order to experiment with remelting and reconfiguring chocolate). All that said, I'm pretty happy with the way these came out. I've picked out the best half-dozen and packaged them in one of the clear, plastic boxes I keep on hand for various stationery projects. 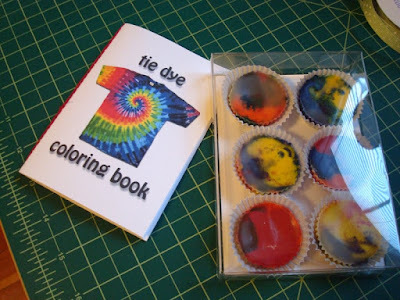 Also, inspired by the way they reminded me of colorful tie-dye patterns, I've paired the set with a miniature (3 1/2 by 5 inches) tie dye coloring book. 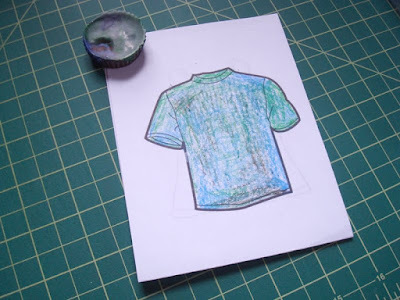 Initially I looked for line drawings of tie dyed t-shirts and what have you. But then I thought offering a blank slate of all the kinds of things one tie dyes made more sense (t-shirts, tote bags, pillow cases, etc.). 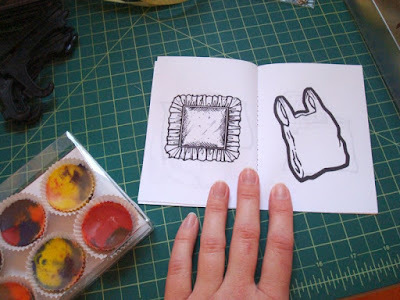 The eight-page coloring book has a card stock cover and a hand-sewn binding. I used one of the darker crayons that is not part of the set offered here to give you an idea of how they perform. Are you in the market for some new, hippie-vibe crayons? As usual, leave me a comment and I'll do a random drawing at the end of the week to determine the lucky winner...Or, in a more likely scenario, "archive" this week's project on my Etsy shop, along with the magnets and bookmarks from the first two weeks of this project. New to the project? Take a look at my intro and rules here.